by Chris Woodford. Last updated: September 10, 2018. You probably already know that the world's favorite drink grows on trees, but did you know there are more coffee trees on Earth than there are human beings? Between us, Earth's seven billion people knock back around two billion cups of coffee every single day, and since quite a lot of people don't drink coffee at all some of us must be gulping it down by the bucket! All that coffee comes from the beans of an evergreen plant that grows in the tropics of three continents: Africa, Asia, and America. How does coffee make the journey from the plant to the cup? Let's take a closer look! Photo: Coffee-making is truly an art. 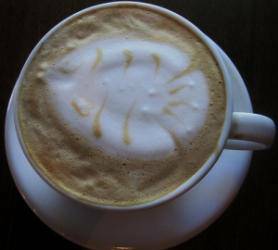 Baristas (skilled espresso coffee makers) decorate drinks with all kinds of attractive patterns formed on top. Photo by courtesy of INeedCoffee published on Flickr in 2009 under a Creative Commons Licence. Find more photos like this in the Flickr Coffee Art Pool. How does your coffee get to your cup? When I was younger, I used to think coffee was a strange, crumbly, brown powder that came in jars, because instant coffee, made by adding hot water to this stuff, was the only kind people in our house ever drank. Soon I learned different: coffee is actually a beverage made from the seeds of a tree that have to be cooked ("roasted") and then pulverized ("ground"). Coffee beans (as the seeds are called) come from all over the world and you can turn them into many different coffee-based drinks using quite a lot of different methods—but they all start out in pretty much the same way: from bushy evergreen trees whose scientific family name (genus) is Coffea. Chart: Which countries produce the most coffee? 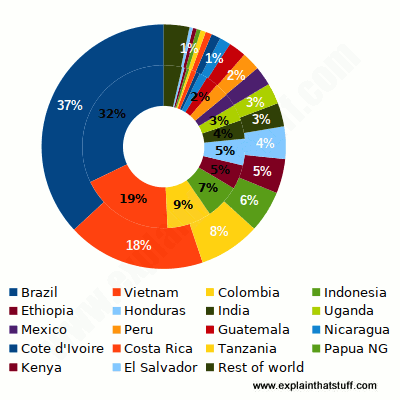 A quick look at this chart reveals how Brazil dominates the world coffee market. The top seven countries produce three quarters of all the world's coffee. This chart is drawn using 2017 figures for total production compiled by the International Coffee Organization. Coffee trees (let's call them that for simplicity) like warm humid places, so you find them mainly in the tropics; leading producers include Brazil (long the world's biggest coffee exporter, and producer of almost a third of all the world's beans), Colombia, Costa Rica, Ethiopia, and Indonesia. There are several dozen different species of Coffea trees, but virtually all the world's coffee comes from just two of them: Coffea arabica and Coffee robusta (also called Coffea canephora). 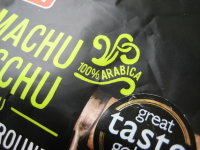 Photo: Quality coffees tend to boast about their arabica content. This one is Machu Picchu from ethical coffee supplier Café Direct. There are many different varieties of aribica and robusta trees. Like all plants, different coffee trees thrive in different growing conditions. If you're a farmer with a large plot of land in a certain part of the tropics, you don't grow just any old coffee tree: you choose a specific cultivar of coffee tree (sometimes called a varietal) that thrives in your particular soil and climate to produce an especially tasty bean that will earn you money. Generally, coffee trees grow best in hilly places. Robustas thrive at lower altitudes (roughly 200–750 meters or 650–2500ft), whereas arabicas thrive in more mountainous regions roughly 1000–2000m (3000–6500ft) above sea level but below altitudes where frost will attack them. As trees go, coffea are modest—and more like large shrubs: they take about 5–8 years to reach maturity, by which time they're about three times as tall as a person (4.5–6 meters or 15–20 feet)—and they're usually pruned below that sort of height to make harvesting easier. Coffee trees have glossy green leaves and stunning white flowers, which rapidly turn into cherry-like fruits, changing color like slow-motion traffic lights from green, through yellow, to a vivid red over a period lasting anything from a few months to a year or more. Break through the skin of a coffee cherry and you'll find a gooey pulp with a couple of hard seeds inside—the beans we know and love. In one year, a single tree produces up to about 1kg (2.2 lb) of coffee. That's enough to make roughly 4–5 of those small bags you'll find in the stores. Photo: Coffee grows on lush coffea trees like these in hot, tropical countries. The fruits (confusingly called cherries) turn from green through yellow to a wonderful red as they ripen. 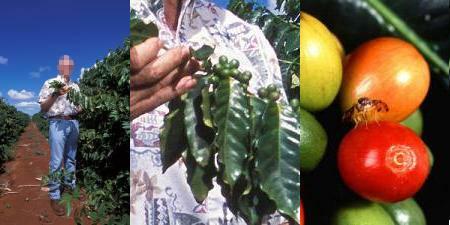 Left and middle (closeup) photos of coffee trees in Oahu by Peggy Greb. Right photo by Scott Bauer. Both photos courtesy of US Department of Agriculture/Agricultural Research Service. Now cherries grow on coffee trees much like fruit grows on any other plant, with some fruits ripening earlier than others. Some coffee estates produce vast amounts of relatively low quality coffee and it doesn't pay to harvest the fruit selectively. Instead, the bushes are completely stripped of all their fruit in a one-time operation, either by an army of workers or using tall machines that shake the cherries off the branches. Once the fruit has been harvested, the cherries are mechanically squeezed to expose the seeds, which are fermented in tanks and washed to remove the sticky pulp before being dried. This method uses a great deal of water so it's called the wet process. Smaller coffee estates produce smaller, higher quality, and much more valuable crops, so they can afford to employ people to wander through the trees selecting only perfectly ripe cherries—and they do this over and over again. Selectively picked beans are dried and depulped in a simpler but more labor-intensive operation, often by leaving them out in the sun and turning them occasionally with a rake. Once dried, they're depulped by machine to extract the beans. Little or no water is involved here so this is called the dry process. Whichever way the beans are extracted, they're filtered to remove waste such as bits of tree branch and stones, sorted by size, graded according to quality, and then bagged up for sale (usually by auction). We call this stuff green coffee and it's exported by the sackload to places such as the United States and Belgium, in Europe, where it's turned into the roast and ground or instant coffee that's probably steaming away in front of you as I type! Most of the coffee people buy is blended: it's made from numerous different types of coffee bean harvested from trees growing in more than one place (often in more than one country). The reason for that is simple. By blending different coffees, a manufacturer can produce a consistent, balanced taste for their coffee that hardly ever changes. Blending also reduces dependence on beans from any one estate (a large farm where coffee is grown), which protects against crop failures and allows coffee makers to buy more advantageously as prices rise and fall. Although some blends are 100% arabica, many mix arabica and robusta coffees to get the best of both: the arabica beans give delicious taste, while the robusta give the blend a "caffeine kick" and help to produce the delicious foamy top called crema when coffee is made in an espresso machine. It's much less common but perfectly possible to buy single-origin (SO) coffees (also called specialty coffees) produced entirely using the beans from one very specific growing region, estate, or crop (people disagree on exactly how to define "single-origin", but that's the basic gist of it). These coffees tend to have more unusual and surprising tastes, they're more expensive, and their flavor and aroma can change significantly from one year to the next—even from month to month as the harvested coffee beans get older. Supping single-estate coffees is a bit like drinking fine wines or single-malt whiskies: you develop not just an appreciation of where your coffee has come from but also how it's been produced and by whom. Photo: If you're tired of dull and uninspiring blends, seek out single-estate coffees from specialist suppliers. This is a vacuum bag of Fazenda Cachoeira da Grama Bourbon Pulped Natural, which grows in Brazil at an altitude of about 1150 meters (3800 ft) in a mountainous part of São Paolo State. It comes from the excellent Has Bean Coffee—a unique online coffee shop run by the infectiously enthusiastic Steve Leighton. Steve is also the face behind a video podcast called In My Mug, which reviews a different specialty coffee each week. Light—Cinnamon, New England, Half city. Medium—American, Regular, High, City, and Viennese (also called Full City, Light French or Light Espresso). Dark—Continental, Espresso, Full, Italian, and French. Apart from turning darker, the beans change dramatically during roasting in a variety of other ways: they swell up, lose about a fifth or so of their weight as moisture and other gases are given off, and become more crumbly as a result. Darker roasts are more smoky and oily than lighter roasts, which are lighter and more acidic. Roasting beans is a bit like making toast: "cook" them too long and you'll kill the subtle flavors—all you'll taste is the roast itself as the beans darken and turn to carbon! This crumbliness makes the next stage of coffee preparation—grinding—much easier. During grinding, the cooked coffee beans are cracked open and chopped into a powder to suit a particular coffee brewing method. You can grind coffee beans in all kinds of different ways (even by hand with a pestle and mortar), but most people use either a hand-cranked mill or an electric grinding machine. Generally, the finer the grind the more flavor will be picked up during brewing, because of the greater surface area of coffee particles in contact with the water. Espresso machines need very fine powder, whereas French presses use a much coarser grained coffee and can't cope with espresso grinds at all (you'll find the finer coffee grinds are left behind in your drink). Filter and drip coffees are ground somewhere in between. Once coffee has been ground, it rapidly loses its aroma and flavor so it's typically sealed in vacuum bags or airtight cans from which air has been removed and replaced with a moisture-free, inert gas. Bags of ground coffee sold in stores typically have sell-by dates that may be a year or two in the future, but coffee connoisseurs generally advise you to drink ground coffee within a month or so of grinding. Ideally, you should avoid pre-ground coffee altogether and grind your own freshly roasted beans moments before you make your coffee. Photo: 1) A basic blade grinder: Grinding is an overlooked and vitally important part of coffee making: it's essential to have your coffee ground uniformly to a grind size that matches your particular brewing method. Top: This is what coffee beans look like after roasting and before grinding. Bottom: This is how the same beans appear after grinding. What we have here is a very fine, powdery espresso grind and takes about 20 seconds to produce with this budget electric blade grinder. This is one of the cheapest grinders but, although it's very quick and easy to use, it doesn't do a very good job: there's no real control of the grind size and some beans get chopped more than others, especially if you try to produce a coarser grind. Electric blade grinders also tend to be unreliable because the oils from the coffee can drip inside and ruin the electric motor. Photo: 2) A burr grinder: True coffee geeks use much more expensive and sophisticated grinders that use burrs (rotating crushers) to smash the beans more slowly and evenly without heating them and killing their flavors. 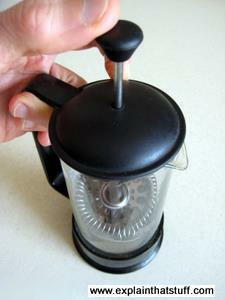 Top: Most hand-operated coffee mills use burr grinders: simply load your beans in the top, turn the handle, and collect your ground coffee at the bottom. You can turn a screw and nut to adjust the grind size. Bottom: You can see how the beans fall between the rotating burrs and get crushed to a powder. Unlike in a blade grinder, each bean is pulverized only once. The problem of how to make a really good cup of coffee is really two problems in one. First, there's the question of how you extract the maximum flavor from the coffee grinds using hot water, without releasing too much unpleasant bitterness. Second, there's the matter of removing the grounds from the water to leave something smooth and pleasant enough to drink. Different coffee making methods tackle these two problems in a variety of different ways. 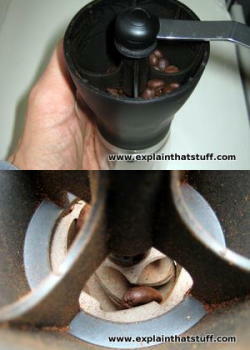 You put the coffee grounds into a paper or gauze filter in a ceramic or plastic holder that sits over your cup or jug. You pour water over the grounds and wait for the coffee to drip through. When all the water's gone, you simply toss the paper filter and grounds in the trash (or compost, if you prefer). This brewing method is often referred to as "pour-over" or drip coffee. How to Make Drip Coffee with Arno Holschuh: This short video on chow.com explains how to improve the taste of your filter coffee by taking more time to prepare. Photo: A typical filter coffee maker by Bodum. 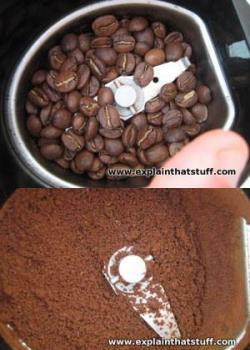 You load ground coffee into the compartment containing the gauze filter (top right), sitting on a glass coffee cup. Then you place the plastic separator (bottom, center) on top, fill it with water, and wait for the water to drip through. Also called a press pot or cafetière. You put ground coffee in the bottom of a glass jar, add hot water, and put on the lid (which has a built in plunger and metal gauze). 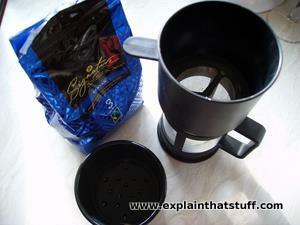 After several minutes of brewing, you press down the plunger and the gauze pushes the grounds to the bottom of the cup. Although a simple and effective way of making "long" coffee drinks, French presses tend to leave a residue of coffee grounds in the cup because their gauzes cannot remove finer coffee particles as effectively as paper filters. Since French presses take several minutes to brew, your coffee tends to be lukewarm rather than piping hot—but some people like it that way. If you find this a problem, buy an insulating jacket for your French press to keep it warm. You can also buy metal presses with double walls that are insulated to retain heat in a similar way to vacuum flasks. French Press Technique: James Hoffmann of London's Square Mile Roasters explains how to pep up your cafetière coffee in this handy little video. Photo: A typical French press. When you push the plunger down, the metal gauze "filters" the coffee ready for you to pour. Enter a typical coffee shop and you'll find a whole range of different coffees on offer, all prepared in a similar way by a skilled coffee-machine operator called a barista. 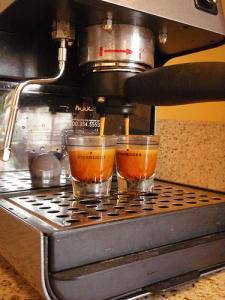 You load up the machine with finely ground coffee, firmly and evenly pressed down (tamped). When you switch on the machine, it fires hot, high-pressure water (roughly 15 times atmospheric pressure) through the coffee to make what's called an espresso or "shot" (a couple of centimeters (a half-inch) or so of super-strong coffee at the bottom of the cup) covered with lush thick foam called crema. You can drink an espresso as it is, add another one (to make a double espresso), or turn it into a variety of other drinks by adding hot water or milk. To make an Americano, you fill up the cup with hot water and a little milk, to taste. For a cappuccino, you add milk, milk froth, and dust with cocoa powder. For a latte, you fill up the cup with heated milk and add a little froth on top for decoration. Intelligentsia: Black cat espresso: A great video showing a barista taking real pains over his excellent espresso. Photo: The best coffee usually comes from professional espresso coffee machines like this. Photo by courtesy of INeedCoffee originally published on Flickr in 2008 under a Creative Commons Licence. This relatively new way of making coffee combines elements of filter, French press, and espresso in a quick, clean, and simple method. 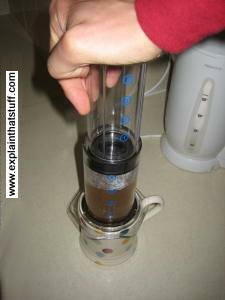 An Aeropress is a kind of giant plastic syringe that you use to squirt coffee into your cup through filter paper. You load a circle of filter paper into the bottom, add your ground coffee, fill up with water, stir the mixture, push down the plunger, and you have an espresso-like coffee in about 30 seconds. Once your coffee is made, you twist off the base of the syringe and push the plunger in a bit more and the press automatically ejects the used coffee and filter paper, leaving itself clean enough to use again. Has Bean Coffee: Aeropress Brewing Guide: There are lots of different ways of using an aeropress, apart from the method the makers recommend. Steve Leighton's method, presented in this little animation (and handy PDF reference), is one of the best I've tried. Top 3 aeropress methods: Tim Wendelboe summarizes three more winning ways of making aeropress coffee. Try these too and see which you prefer. Photo: An aeropress is a big plastic coffee syringe. 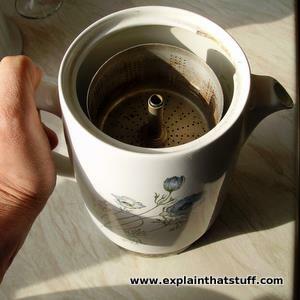 You use air to push hot water through ground coffee into a cup or mug standing below. Percolators are either heated on a stove top or have a built-in, electrically powered heating element. Either way, you'll find they have two parts (a water container at the bottom and a ground-coffee container with a built-in filter at the top) linked by a tube. When you switch on the heat, the water bubbles up the tube, then drips through the coffee and falls back down again. So the water in the container gradually turns to coffee and becomes stronger the longer you leave it. What makes a percolator different from a filter is the way the water constantly recirculates through the coffee, becoming more concentrated all the time. That's why percolators generally make much stronger coffee than filters. Photo: An electric coffee percolator by Wedgwood. You load ground coffee into the metal basket, which sits on a metal stalk inside the ceramic pot, and then put a metal cover (not shown in this photo) on top, followed by the lid of the ceramic pot. When you switch on, a heating element at the bottom of the pot, powered by electricity, heats the water so it bubbles up through the coffee. Making an excellent espresso is a skillful business—some would even say an art. For people who relish the end product (a superb cup of coffee) but loathe all the effort involved filling and cleaning the machine, an alternative is to use a pod coffee maker (popular brands include the Tassimo, Senseo, and Nespresso). You simply buy pre-prepared "pods" of coffee (small plastic containers vacuum sealed with an individual serving of ground coffee) and load them into your machine. Fill the machine with cold water, press a button, and your coffee appears less than a minute later. Although quick and convenient, pod coffee makers suffer from several drawbacks. The coffee in pods is seldom very fresh and the range available is nowhere near comparable to the huge range of fresh ground coffees. Enjoying coffee is all about personal taste, but if you browse reviews on shopping websites you'll find very mixed reactions. The great simplicity of pod coffee makers—press one button and your coffee is made—is also their great drawback, because there's little or nothing you can alter to make your coffee taste any different. The range of coffees varies from maker to maker and pods available for one machine generally don't work in another, because the manufacturers want to make their money out of you repeatedly buying their brand of coffee. The pods are also relatively expensive, compared to buying bags of beans or ground coffee or jars of instant. Photo: Pod coffee makers are marketed as espresso machines anyone can use, but don't be fooled: they really don't produce coffee anywhere near as good as a coffee shop barista! Advertisements for these machines promise to make you the freshest cup of coffee you've ever tasted—and it's easy to see why. You load fresh coffee beans in at the top and the machine grinds them up to make your coffee then and there (usually by the filter method). Machines like this are relatively expensive; they can be noisy, slow, and they have quite a lot of bits to clean (both the grind mechanism and the filter itself). If you really like super-fresh coffee, there's nothing to stop you buying a separate hand grinder or electric grinding machine and freshly grinding your beans for use with a French press, an Aeropress, a filter, or any of the other coffee-making methods. 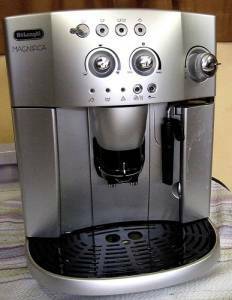 Photo: A typical bean-to-cup coffee maker made by DeLonghi. Photo by courtesy of David Masters published on Flickr in 2009 under a Creative Commons Licence. Instant coffee (also called soluble coffee) is manufactured by mixing ground coffee with hot water then removing the water in one of various ways. The most common methods include blowing air over the mixture or freeze-drying. Freeze drying means you freeze the coffee into great solid brown slabs and then pressurize it to remove the moisture, leaving behind the dehydrated, crumbly crystals we know as instant coffee. Add hot water and you magically turn these granules back into coffee again. One drawback of most instant coffee is that its made from relative cheaper and lower quality robusta beans, though superior brands do claim to use arabicas. Coffee geeks who've read this far will be choking, spluttering, or sniggering that instant coffee is included in this list—but a quick trip to the grocery store will show you why: supermarkets allocate shelf space precisely according to what people buy, so the vast majority of people do, in fact, make their coffee in this very crude way. Are they crazy? Of course not. This is arguably the quickest, simplest way of making a drink that tastes something like coffee as you scramble to get ready for work first thing in the morning. But once you've developed a taste for excellent ground coffee, you're unlikely ever to want to return to dusty brown powder in a jar. 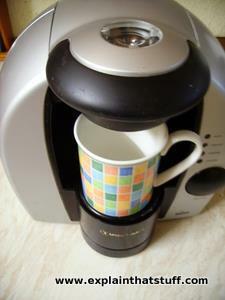 If you routinely make instant coffee, why not try some of the other methods up above and see if you prefer the taste. Buy yourself a cafetière and a bag of ground coffee for starters and see how you get on. 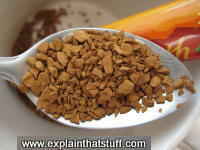 Photo: Typical instant coffee granules. International Coffee Organization: A forum for coffee producing countries. Includes lots of background information and statistics. Coffee Review: Glossary: A good explanation of all those baffling coffee terms. Coffee Review: Lots to enjoy on this detailed website, including articles about coffee, reviews, and more. INeedCoffee: Michael Allen Smith's website is an excellent resource for coffee lovers, covering every topic you can possibly imagine, from practical tips on making better coffee to culture, travel, and even coffee comics. Coffee Geek: News, views, and reviews for coffee enthusiasts. Home Barista: Another great site for enthusiasts, including how-tos, news, reviews and a very active forum. Brew Methods: Alternative approaches to brewing coffee using the various different brew methods (espresso, French press, Aeropress, and so on). The Long History of the Espresso Machine: The Smithsonian: Design Decoded, June 19, 2011. A great history of espresso machines and the various inventors who refined their design, including Angelo Moriondo, Luigi Bezzera, and Pier Teresio Arduino. In my mug: Steve Leighton's video blog/podcast is unmissable if you're into single-origin, specialty coffees. Each week, Steve shares his thoughts on a new coffee and if you subscribe through his shop, he'll mail you the coffee to taste at the same time. Tamper Tantrum: Coffee thoughts from Irish champion barista Colin Harmon, Has Bean's Steve Leighton, and friends. 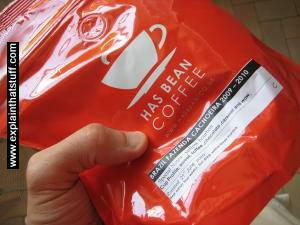 Jim Seven: The thoughtful blog of coffee roaster and 2007 world barista champion James Hoffman. The World Atlas of Coffee: From beans to brewing - coffees explored by James Hoffman. Mitchell Beazley, 2018. Coffee: A Guide to Buying, Brewing, and Enjoying by Kenneth Davids. St. Martin's Press, 2013. Espresso Coffee: The Science of Quality by Andrea Illy and Rinantonio Viani. Academic Press, 2005. A comprehensive look at coffee science and technology. The Devil's Cup: Coffee, the Driving Force in History by Stuart Lee Allen. An alternative account of coffee's role in world history.